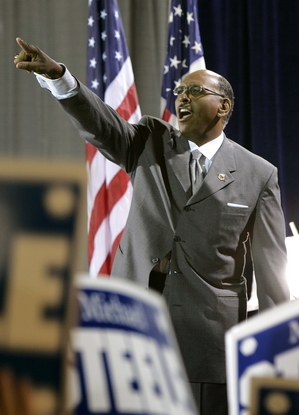 Michael Steele’s impotent tenure as Chairman of the Republican National Committee has come to the sad end everyone has long expected. Steele, who aside from being a black Republican is best known for his remarkably incompetent boobery, recently referred to the Afghan conflict as ‘a war of Obama’s choosing.’ This claim is absolutely true, if by Obama he means George W. Bush. Otherwise, it’s pretty idiotic. But Steele wasn’t done: “This was not something that the United States had actively prosecuted or wanted to engage in,” he said. This statement is also true, assuming that the “not” was a verbal typo. If it wasn’t, this statement would sound moronic coming from an encephalic six-year-old. "Okay, We've Got Three Happy Meals, Two Milkshakes And An Apple Pie. Would You Care To Supersize It?"